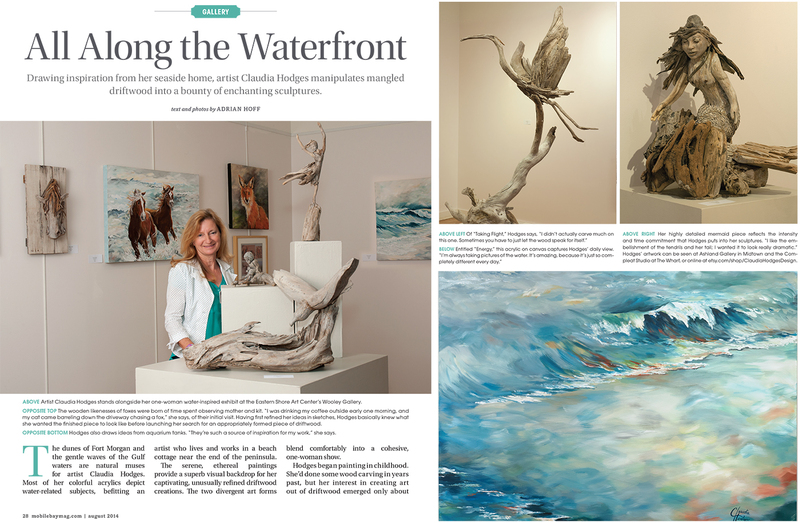 Drawing inspiration from her seaside home, artist Claudia Hodges manipulates mangled driftwood into a bounty of enchanting sculptures. by Adrian Hoff. Mobile Bay magazine, August 2014. People Pix - Editorial, Business, Politics, etc. Claudia Hodges’ colorful acrylics adorn the walls of the Eastern Shore Art Center’s Wooley Gallery. Most depict water-related subjects, befitting an artist who lives and works in a beach cottage near the end of the Ft. Morgan peninsula. The paintings provide a superb visual backdrop for unusual driftwood sculptures, which occupy much of the available floor-space: two divergent art forms blending comfortably into a cohesive, one-woman show. A resounding, “this is awesome!!! !” announces the opening’s first wave of visitors. A woman approaches, husband in tow. “Beautiful! Your work is beautiful. You do painting and sculpture,” she says to Hodges by way of a greeting. “What is this made of?” the husband asks, eyeing a nearby mermaid. 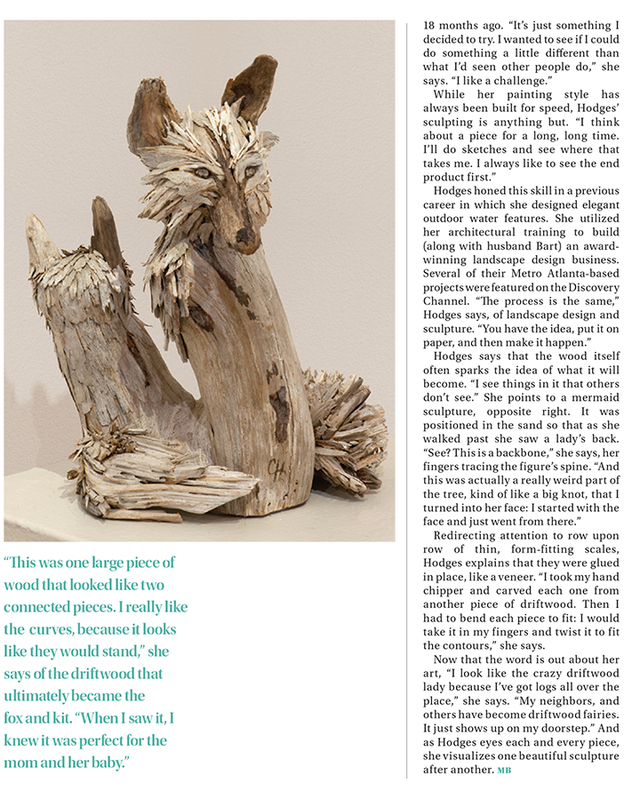 “It’s driftwood; the figure is all one piece, except for the fins and the hair,” replies Hodges. Hodges explains that the wood itself sparked the mermaid idea. It was positioned in the sand so that as she walked past she saw a lady’s back. “See? This is a backbone,” she says, her fingers tracing the figure’s spine. “And this was actually a really weird part of the tree, kind of like a big knot, that I turned into her face: I started with the face and just went from there,” she continues. “All one piece,” he mutters to himself. Redirecting his attention to row upon row upon row of thin, form-fitting scales, Hodges tells him that they were glued in place, like a veneer. “I took my hand chipper, and I carved each one from another piece of driftwood. Then I had to bend each piece to fit: I would take it in my fingers and twist it to fit the contours,” she says. “Geeze! What patients,” he exclaims, before wandering off in pursuit of his wife. I suggest that her inner-architect is showing through. She agrees, but reminds me that she never actually worked in architecture. Hodges designed elegant outdoor water features rather than buildings; she utilized her training to build (along with husband Bart) an award-winning landscape design business. Several of their Metro Atlanta-based projects were featured on the Discovery Channel. Their wooden likeness was born of time spent observing mother and kit: a mental image refined, as always, in her sketchbook. She basically knew what she wanted the finished piece to look like, before launching her search for an appropriately formed piece of driftwood. She stops to update Bart on how well the show is going. “It’s nice to see people’s reactions; nice to get some love after all of your work,” she says, smiling, but obviously tired. Then she’s off again, fielding visitor’s questions and compliments, explaining technique and aesthetics.